A native of the bacalhau capital of Norway, Minister Harald T. Nesvik visits CADEG and causes amusement when saying that «the smell of bacalhau is the smell of money» to him and his fellow Ålesund townsmen. But the Norwegian Minister of Fisheries is quite right: Fisheries and aquaculture are among the important ocean industries that the Norwegian economy depends on, and the value of Norwegian exports of clip fish in the first quarter of 2019 is of NOK 1,1 billion, an increase of 17 percent compared to the same period of 2018. Almost one third of the fish was exported to Brazil. This also explains why a delegation of 11, representing the Ministry of Trade, Industry and Fisheries, Veterinary authorities, the Norwegian Food Safety Authorities, Norwegian Fishermen’s Sales Organization and the Directorate of Fisheries, accompanied Minister Harald Nesvik during the four day visit to Brazil. On April 4, 2019, Minister Nesvik met with Brazil´s Minister of Agriculture Tereza Cristina Corrêa da Costa Dias in the capital Brasilia. He also formally opened a seminar in the Ministry of Agriculture, where several Norwegian speakers gave presentations. «We need rules and regulations that promote trade instead of creating barriers. Dialogue is fundamental, and we are on a good track. The free trade agreement between Brazil and EFTA is on top of the agenda for the meeting with my Brazilian colleague», Minister Nesvik told NBCC before traveling to Brasilia this week. His delegation arrived in Rio de Janeiro on April 1, after spending six days in Chile on a state visit with the Norwegian King and Queen. 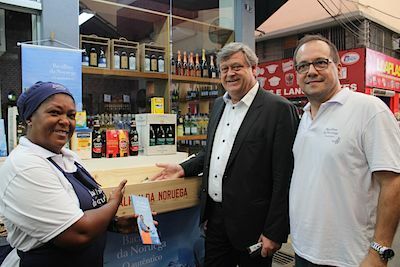 On April 2, the Minister took part in a marketing event in a local supermarket before meeting Brazilian importers of seafood in the Aquario, for an informal gathering. 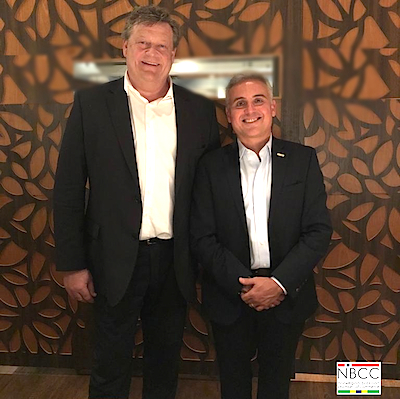 At night, Minister Nesvik met NBCC president Alex Imperial (in the photo to the left), Executive Director Glorisabel Garrido Thompsôn-Flores and many other representatives of the Norwegian Brazilian business community in Rio de Janeiro during a dinner at Fogo de Chão. «This is my first time in Rio, and I must say the city is amazing. Tonight we are bringing together Norwegian and Brazilian companies who all share a common interest in the ocean. Our oceans provide great opportunities. In Norway as in Brazil», he said in an address during this event. 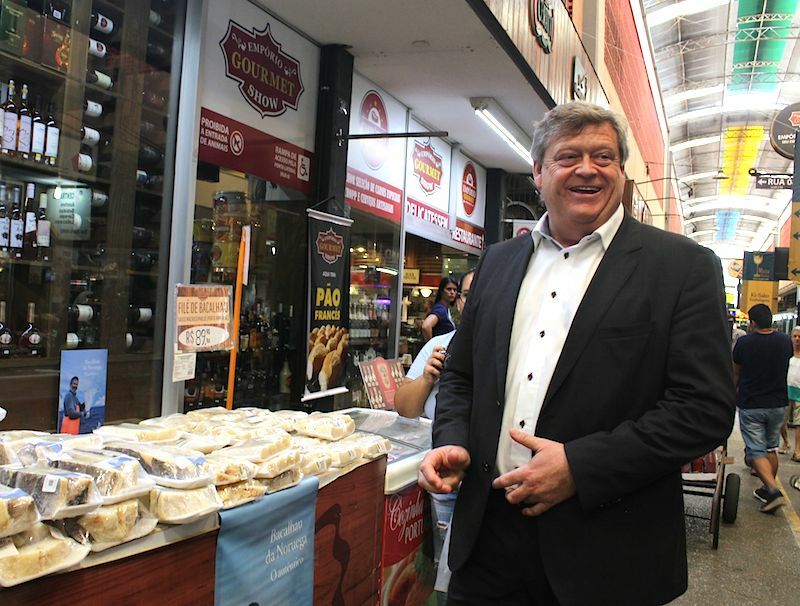 On April 3, the Minister and his delegation headed to CADEG, the municipal market in Benfica, Rio de Janeiro. As the Easter holiday is coming up, the market is preparing for a rush of consumers looking for bacalhau to put on the dinner table during the holiday. «This is a very nice place with a special, informal atmosphere, a place to experience, to see the fish, to smell, to eat, and not only to go shopping. I love the combination of fish, olive oil, wine, vegetables – all the ingredients you need for a good meal. The way you do it here, is the right way to sell bacalhau and I am very satisfied to see how you do it. I am from Ålesund, the capital of bacalhau in Norway, and I used to work in a bacalhau processing factory, so I am very familiar with the curing and production process», Minister Nesvik said. He even explained why the bacalhau is sold without its head. To Brazilians, the destiny of the head of the bacalhau is perceived as a great mystery, but the explanation is actually quite simple. Mr. Nesvik with a bacalhau promoter and a CADEG shipowner. 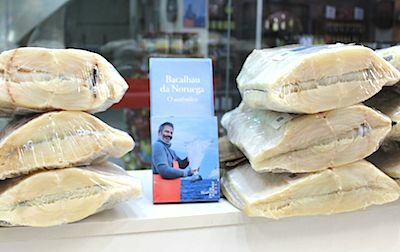 «The head is removed in the process because we do not use it, and it would also be difficult to dry it and achieve the quality we want.» The quality of the dried fish is a concern to the minister, as «quality» and «origin» are main pillars in the marketing of Norwegian bacalhau. «Customers should always know what they get», he says. Minister Nesvik is himself a true lover of bacalhau. «I eat it as often as I can. It has become a tradition for me to invite friends and family on bacalhau for Easter and I often prepare it with tomatoes, but another personal favorite of mine is to gratinate the bacalhau. I put it on a bed of almond potato stew, then cover the fish in a ceviche of onion, and then I put cheese and fried chorizo sausages on top, and serve it with tomatoes baked in the oven and steamed asparagus», Harald T. Nesvik explains. Maybe something to try out for Easter?